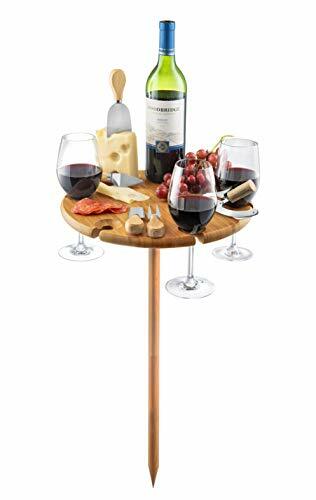 The Bambüsi wine table and cheese board will captivate the attention of your surroundings with your specialties of Italian Ricotta, artisan bread, desserts, crackers or other snacks. Outlined to be conversation starter between guests and acquaintances, this elegant table is created with the idea to enjoy the outdoor with style. Whether you like having red wine at the offshore, at the park, concert, festival or in the backyard, the Bambüsi wine table is a groundbreaking answer to your picnic needs. We chose bamboo wood as it is one of the best and most sustainable resource that is environmentally friendly and yet luxurious that leads the way in the preservation of a healthy and responsible lifestyle. Other reason for crafting this beautiful table with bamboo is its natural anti-bacterial, anti-fungal and anti-viral properties that never spoil your foods with odors, colors, or chemicals and maintain its beauty and elegance for years to come. The collapsible design of our cheese board allows you to set it up in minutes without ever using any tool. Under the main surface, you will find all the cutting tools on the hide-away cut out sections and place it on the hanging support on the side so everyone can slice cheese and self-serve. Wine lovers and outdoor enthusiast will be impressed with this unique outdoor table for summer activities. It makes an awesome gift for birthdays, housewarming, wedding, anniversary, and more. Backed by our unconditional customer satisfaction. Click the add to cart button and order your cheese board and wine table today! ★ STELLA CUSTOMER SATISFACTION GUARANTEED! - Enjoy our exclusive collection risk-free. Bambüsi backs your purchase with a 30-day money back guarantee if for some reason our product does not live up to your expectations. You can also contact us for a replacement if there's any issue.